The Shulba Sutras or Śulbasūtras (Sanskrit śulba: "string, cord, rope") are sutra texts belonging to the Śrauta ritual and containing geometry related to fire-altar construction. The Shulba Sutras are part of the larger corpus of texts called the Shrauta Sutras, considered to be appendices to the Vedas. They are the only sources of knowledge of Indian mathematics from the Vedic period. Unique fire-altar shapes were associated with unique gifts from the Gods. For instance, "he who desires heaven is to construct a fire-altar in the form of a falcon"; "a fire-altar in the form of a tortoise is to be constructed by one desiring to win the world of Brahman" and "those who wish to destroy existing and future enemies should construct a fire-altar in the form of a rhombus". 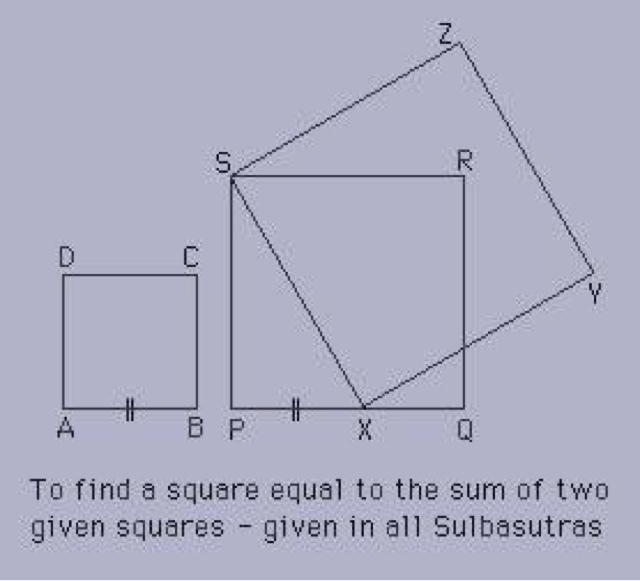 The four major Shulba Sutras, which are mathematically the most significant, are those attributed to Baudhayana, Manava, Apastamba and Katyayana. Their language is late Vedic Sanskrit, pointing to a composition roughly during the 2000bce The oldest is the sutra attributed to Baudhayana, possibly compiled around 3500BCE while the youngest content may date to about 2000BCE.